Determining commission structures for sales reps is a critical piece to your sales plan. It sets the bar for the level of talent and skill set that you’ll attract to your sales team. It seems simple, right? More money = better salespeople? This isn’t always true. Higher earning potential through a commission time only comp plan won’t necessarily outweigh the risk a salesperson inherits by not having a guaranteed income source. Elite sales professionals expect to be paid a salary that they can rely on. In short, a sales rep views their base pay as how they’ll be valued and treated by the company. Their salary is what they rely on to live. What Is A Sales Commission Structure? Sales commission is most commonly known as the variable component of a total sales compensation package. 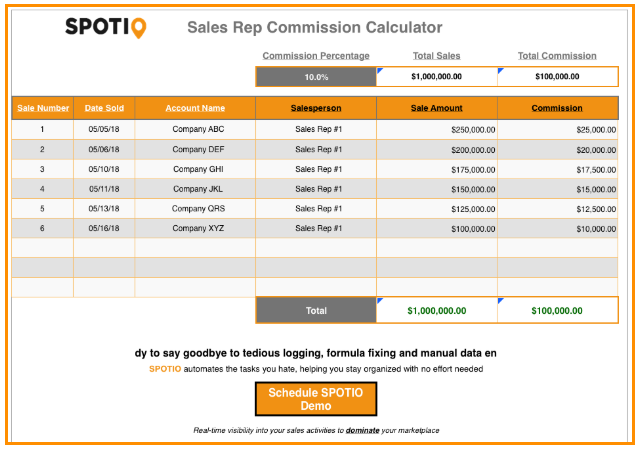 While an on-target earning (OTE) is almost always established, the total commission earned is dependent on each salesperson’s individual goals and their performance. Your commission structure ties a sales rep’s performance to the amount of money he or she will take home each paycheck. It’s no secret that accountability produces results, and a well-structured commission plan is an excellent way to incentivize top performance. So, while the salary component of a salesperson’s comp package is fixed and pretty easy to understand, the variable portion has a large amount of room for flexibility and configuration depending on the type of sale and sales process a company has in place. Because there’s no one size fits all, sales compensation plans come in many shapes and sizes, including: salary/hourly + commission, commission-only, tiered commission, residual commission, and variable-rate commission. Of these, the easiest and most commonly used approach is to pay a certain percentage based on the revenue generated from a single sale. Very simply, a sales rep who closes a deal for $500 with a commission rate of 5% earns $25 per sale. 1. What are the company’s sales goals and sales budget? 2. How much should you pay and how much should they sell? 3. How long is the average sales cycle for your product or service? 4. Are you offering benefits, bonuses, or incentives of any kind? 5. Is this a fair structure that will motivate each salesperson to work hard? 6. What is the average revenue per sale (ARPS) or average price point? 7. What is the salesperson’s role: lead generator / canvasser or full-cycle? 8. Does the salesperson provide support and training to the customer post-sale? 9. Is it a one-time sale or is there typically repeat business and upsells? 10. Does the sales rep handle customer service / account management, or do you have a team? Answering these questions will help you determine SMART sales goals, performance measures, and payout formulas. Doing so will allow you to more accurately judge how much you should be paying your team, and how your commission plan should be structured. Good rule of thumb: The more time and energy required from the sales rep to provide service and complete the sale, the higher the commission rate should be in order to compensate their efforts. By laying out detailed answers for the questions above, you’re ready to follow this simple 5-step approach that will guide you through the process of creating a fair – but effective – commission structure. A challenging, yet achievable, commission structure serves as motivation and inspiration for salespeople. Remember that your commission structure extends well beyond just compensating your sales team for their work. Science has proven the best strategies to motivate sales reps. Compensation is an extrinsic motivation, and while it’s not enough on its own to keep salespeople hungry 24/7, a poorly structured commission structure can actually demotivate your foot soldiers. Setting the standard for what your salespeople should be paid involves looking at more than just the work they put in. Start by establishing a benchmark for a sales rep who achieves their sales target in your market and industry. If you need help, reach out to people you know in this position or, if you’re part of an association within your industry, use them as a resource; they should be able to provide you with a considerable amount of relevant data. After you’ve determined what your benchmark will be, then comes the fun part associated with creating a sales commission structure. Now is when you need to set individual goals. This is what each salesperson’s performance will be measured against. You may be a rock-star, but don’t forget how difficult it is to find top performers. Set your standards based on above-average salespeople so that the target is challenging, but not on the level you expect of top performers. Crunch the numbers to ensure you’re setting realistic quotas and not making it too easy or too hard. The graphic above shows that only 9% of the sales compensation expense was used out of the 15% allocated. The company now has 6% to use toward incentives, marketing, sales coaching or other resources to help the team reach their goals. Choosing whether to pay your sales team salary only, making them 100% commission-based, commission-only but with a draw, or any other combination is a difficult decision. It often feels like a balancing act between trying to put a plan in place that properly incentivizes while making sure the company is making its margins. The phrase, “it’s the little things that often matter most” has never rang more true than it does as it relates to sales commission structure. Salespeople loving bragging about the perks they receive from their job. Whether it’s a cool office, providing breakfast every morning or covering expenses, these simple “extra” things go a long way. The top commission structures for the door to door and field sales industries aren’t necessarily revolutionary, but each model has several variations. Some companies combine and blend the methods outlined below to create a more specific plan that better matches their process. Determining a standard or uniformed commission rate for outside sales reps is particularly challenging due to the vast number of unique sales processes and commission structures that have been established. The low end usually bottoms out at 5%, with some companies paying as much as 40 – 50% commission per sale. These are typically businesses that have implemented a commission-only structure. Despite such a large range, the industry average usually tends to land between 20 – 30% of gross margins. It’s also sometimes broken down by gross sales with the industry average ranging from 7 – 15%. This translates to an average annual salary of $66,805 for outside sales reps. Indeed lists the average tenure for this position as 1 – 3 years. A commission only plan is the better of the two options if deciding between commission and salary or hourly only. A straight commission structure means a sales rep’s earnings will consist of entirely variable pay. It’s a rather risky option for some salespeople, especially those who are new. This is because there’s not a fixed salary component. Paying hourly severely limits the company’s ability to get maximum productivity from their team. A commission only structure is typically used for 1099 sales reps (independent contractors). With this type of sales commission structure, the sales professional who thrive are those eager to hunt and close their own deals. It can be pretty difficult for some individuals to determine what outside sales job will suit them best based on their experience, personality and selling ability. There’s not only risk for the sales rep in a commission only model, but for the company too. A commission only plan is best suited for companies with shorter sales cycles and a considerable opportunity for sizable commission earnings. These plans do come with a rather large amount of risk for the rep. If they aren’t generating revenue for the company, they aren’t making money for themselves. This can lead to a large amount of turnover and unhappiness, casting a black cloud of negativity that destroys your company culture. When implementing this model, recruit and hire the sales professionals who understand the difference between a sales job and sales career. They’ll have far more experience under this structure and understand what they’re walking into prior to joining your team. Revenue commission models are one of the most well-known and basic structures available to field sales organizations. This type of sales commission structure works best with products and services that have a set price point. Example: If your company sells a service for $500 that has a commission rate of 10%, a sales rep would earn $50 each time they sell that service. They’re also favorable for companies attempting to gain market share or enter a new market because they’re less likely to be focused on profit, and more concerned with achieving a larger business goal. It should be noted that revenue commission plans typically fail to align with the larger, broader goals of a field sales organization or the unique DNA makeup of a sales team. Contrary to simply looking at the money coming in with each sale like in a revenue model, a gross margin commission structure includes the sale price and the costs associated with converting that sale. By taking both into consideration, the company arrives at the profit of each deal. Example: If your company’s service costs $1,000 but accrues $500 in costs to complete that transaction, the sales rep would earn a percentage of the remaining $500 profit. Those supporting a gross margin commission structure usually believe that all sales should benefit the company’s bottom line. A draw against commission is excellent form of reassurance for your sales team. A draw is essentially a “guarantee” that a sales rep will make a predetermined amount of money each month for their efforts, regardless of their sales figures. Draws are best for new hires, ramp periods, long periods of change and uncertainty, and training. Draws against commission are basically advanced payments to the sales rep. A rep who earns commission smaller than the draw amount keeps their commission, plus the difference between the total commission and the predetermined draw amount. There are a few variations to this structure, most notably, a “borrowed” draw that must be paid back according to the specified terms. Example: A sales rep is eligible for a $2,000 draw in their first month and winds up taking home $1,000 in commission. The sales rep would then keep all of his or her commission in addition to $1,000 from the set draw allowance. A tiered model is a sales commission structure that is particularly popular among sales reps, especially those who are highly motivated or top performers. Sales people earn higher commission rates after closing a certain number of deals, or, surpassing a total amount of revenue generated. Example: A sales rep earns 5% on all products sold up to $10,000 in total revenue generated. Under the tiered model, the same sales rep would now earn 8% on all revenue generated after surpassing the $10,000 mark. This sales commission structure significantly motivates and incentivizes the top performers to continue selling. A tiered model provides salespeople with the freedom and flexibility to explore additional areas they may not have considered previously, like upsells and new product offerings. Base pay rate only is rarely used in today’s sales landscape for multiple reasons, one of which being its lack of incentives. Failing to properly incentivize results in an exceptionally low level of productivity due to a lack of motivation. Example: Your company pays each sales rep an annual salary of $60,000. This translates to a weekly take home pay just over $1,150 (before taxes), regardless of performance level. A base pay only structure is most often used by companies who operate almost exclusively on inbound leads. These businesses have a sales staff that is almost in more of a customer support role than they are a sales position. The skill set required to succeed is fairly basic since the sales team works primarily on inbound leads. A base pay rate is most effective when your team is there to walk potential customers through the questions they have as opposed to overcoming objectives, for instance. If you want to attract the best salesmen and saleswomen, you’re going to have to pay for it. Like most things in life, you get what you pay for. Offering an hourly rate in addition to commission places responsibility on both parties, the company and the sales team. Both sides are making a commitment. The company is committing a greater financial reward to the salesperson by paying them for their time in addition to what they sell. The sales rep is committing their full skill set and effort to working to earn that hourly rate or annual salary. In this setup you’ll pay less per hour / base salary than you would if you were just paying an hourly / base rate. The same is true for the commission your organization will offer, but in total, there is much more upside for the sales rep. Commission should always be uncapped to properly incentivize the reps on your team. The best sales reps in the industry are looking for companies who will invest in their success. One of the best ways to show that you have their best interests in mind is to measure the exact times they make the most money. The key is having the data to back it up. In order to determine these types of advanced analytics, you have to stop being lazy and track every attempt they make. Tracking the outcome of every door your sales team knocks on will give you the metrics needed to determine when they’re having the most success, and ultimately making the most commission. To determine the best sales commission structure for your business, it’s paramount to understand the importance of an efficient and effective sales process in the field sales industry. Fine-tuning your sales process will help you develop a sales commission structure that is beneficial to all parties.